If you follow me on any form of social media, you would have probably seen a plethora of posts about my new drone. 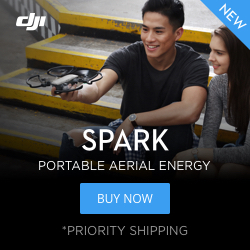 I had a Phantom 3 Standard in the past but sold it as soon as the DJI Spark was announced. I purchased the Meadow Green Spark with the accompanying Fly More Combo. Crazy bang for your buck, you get an extra battery, extra propellers, prop guards, a three-battery charger, the really nice carry case as well as the controller. INSANE! So I got this pack and this drone is so much fun to use. It is so easy to get up in the air and record some absolutely stunning pictures and video. I have quite a few videos already on my YouTube channel already but I wanted to share this one. I recently tried out all of the different QuickShot modes the DJI GO 4 app allows the Spark to do. So in this video I show off not only the Palm Launch feature but the Active Track, the Circle mode, The Helix as well as the Rocket mode. One of the reasons I really like this little drone is how small it is. The drone with all the accessories in the case is so much smaller than the lunch box I bring to work every day. I am so ready to take this little guy on vacation and traveling around to places. It is going to be a million times more convenient than the Phantom was to carry around. Add in all these QuickShot modes and there are going to be some masterpieces made! I was a little nervous to try some of these QuickShots out. Make sure you have plenty of room when you are trying them. There were some light poles all around me so I had to cut the Helix shot a little short. Enjoy and don’t forget to subscribe for more videos!